First there was pizza. 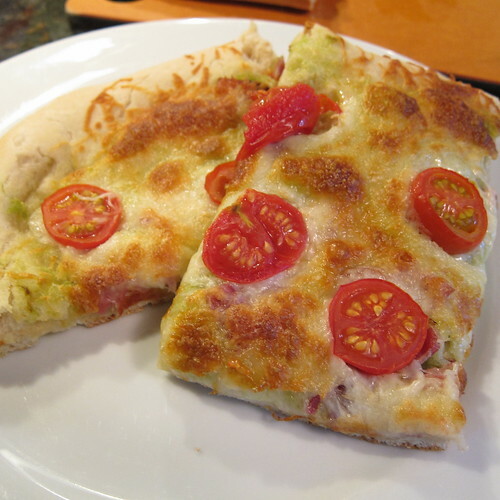 This one was topped with the pesto then chopped cottage bacon (oh, so amazing on pizza, not quite bacon, not quite ham), mozzarella and fresh tomatoes. The fresh, mild garlic flavor of the pesto infuses every bite. But this, this is what garlic scape pesto is made for, Green Eggs and Hash. 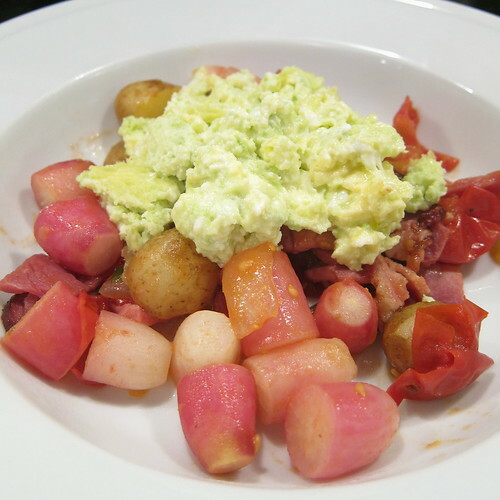 The hash here is just a mix of seasonal vegetables, radishes, potatoes, onions and cottage bacon. The eggs though are the star. Matt took a heathy spoonful of the pesto and about 1 oz of cream cheese and mixed it in with 4 eggs. Then he just soft scrambled them. These eggs are as light as air with a heavenly garlic flavor and just the slightest tartness from the cream cheese. The were so good we had them again later in the week without the hash. We still have about a cup of the pesto left, any other good ideas out there? How about pesto on quesadillas? I have never cooked with garlic scales but this pesto sounds so good. I bet it would be good spread on crostini or toasted bread. I love these ideas. The egg one is pure genius- must try! Never would have thought of the egg idea one. I love it. I am going to try it. We've been putting it on pizza too. The other night I mixed it with ricotta and used that as the pizza sauce and topped it with spinach and a little mozz. Your creations look so good!